Does the prospect of Sarah Palin in the White House scare you? Comic books show us it could be much, much worse. Following gains by the Republicans in the US House of Representatives during the recent mid-term elections, there is renewed speculation that Sarah Palin will emerge as the GOP’s presidential candidate in 2012. While there are many who are elated by this prospect, the possibility of a Palin presidency is causing concern both from within the Democratic Party and the GOP itself. Sometime in the future, most of the human race is wiped out in a calamity known only as the “Great Disaster”. Intelligent animals (who now walk upright like humans) become the dominant life forms, including gorilla, tiger, lion, rat and dog men. Humans regress into a more primitive state and are used mainly as slave labor by their animal masters. 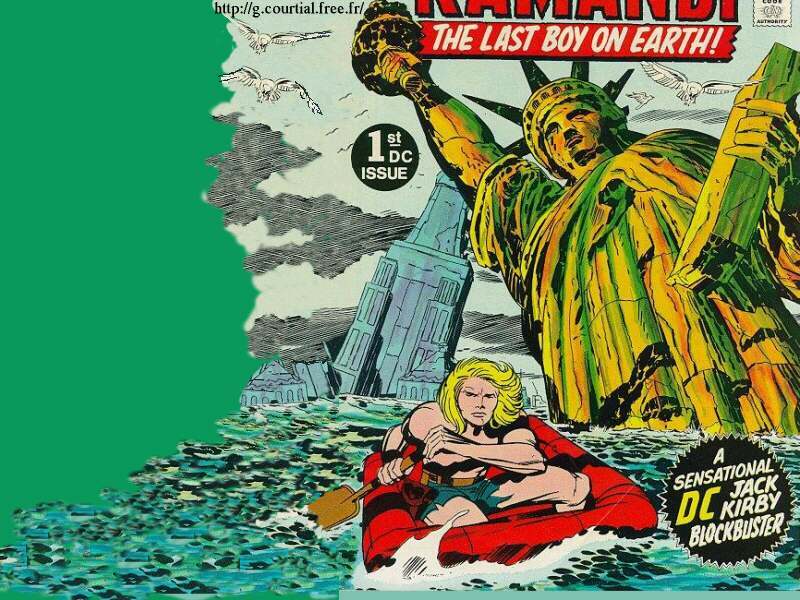 This is the world of Kamandi, the last boy on Earth, first published in 1972 (DC Comics). Following nuclear holocaust, mankind is forced to live in over-crowded “Mega-Cities” because what’s left of the US is an irradiated wasteland called the “Cursed Earth”. Crime is rampant and the cities are policed only by “Street Judges” (like the hero) who have the power to arrest, sentence and even execute those they deem criminals on the spot. Judge Dredd first appeared in the British science fiction anthology 2000 AD in 1977. A group of mutants assassinate a US Senator, prompting the government to activate the Sentinels, deadly giant robots, who then decide that the only way to eradicate the mutant threat is to take over the government. Thousands of mutants, super-powered humans and ordinary humans alike are slaughtered in the process. The survivors are herded into concentration camps. We saw a glimpse of this future in “Days of Future Past”, X-Men #141-142, published in 1981 (Marvel Comics). The elder gods known as the Ogdru Jahad invade the earth from their hellish dimension and sweep over the planet, killing everyone. Hellboy fulfills his role as the Anung Un Rama (the Beast of the Apocalypse), ushering in the End of the World. Hellboy’s role in the Apocalypse was first foretold (though not actually played out) in the first miniseries Hellboy: Seed of Destruction in 1994 (Dark Horse Comics). We also got a glimpse of these scenes in the first Hellboy movie. The Cold War never ends, criminal gangs run wild in the cities and the US government is a fascist state with Ronald Reagan as President. All super-hero activity has been declared illegal, except for a certain blue and red-clad Kryptonian who operates in secret on the orders of the government. This future was seen through the eyes of an elderly Bruce Wayne, forced out of retirement in The Dark Knight Returns, published in 1986 (DC Comics). Super-human activity reaches its apex. Battles between meta-humans spill out daily onto the streets of America’s cities, without heed to property damage or civilian casualties. The conflict erupts into full civil war, prompting the United Nations to order a nuclear bomb dropped on American soil. These events were chronicled in the miniseries Kingdom Come, published in 1996 (DC Comics). A mysterious plague wipes out every living mammal possessing a Y chromosome — including embryos, fertilized eggs, and even sperm. The only survivors are a male New York resident and his pet monkey. The survivors (all women) must deal with what remains of the world, including humanity’s impending extinction. This future was depicted in Y: The Last Man, published in 2002 (Vertigo / DC Comics). Sometime in the future, a catastrophe puts an end to civilization as we know it. Cities lie in ruin and zombie-like monsters roam the subways. The world is policed by the Global Peace Agency and its single super-human operative, code name: One Man Army Corps (OMAC). OMAC: One Man Army Corps was first published in 1974 (DC Comics). Lex Luthor is elected President of the United States and then assassinated by none other than Superman. The Justice League then decides to take over the United States government, running the country as a police state. They then change their name to the Justice Lords. This alternate future was shown in the two-part “A Better World” from the Justice League cartoon TV series in 2003. In the not-too-distant future, the United States is taken over and divided between a number of super-villains, namely Doctor Doom, Magneto, the Red Skull and the Abomination. (The latter’s territory is then seized by the Hulk.) Most of the population, including the super-heroes, is dead and most of the US is now a barren wasteland. We saw this future through the eyes of an elderly Logan (aka Wolverine) in the miniseries Wolverine: Old Man Logan, published in 2008 (Marvel Comics).